The last several years have seen climate change expand from a mostly "environmental" threat that engaged a small minority of the world economies, into a wide-ranging environmental, economic, moral and military threat that now has a sizeable majority of the world's economic powers committed. Here's a look at what has changed since the last climate conference. Six years ago, as the world headed into the Copenhagen 2009 climate conference, only a quarter of the world's major greenhouse-gas emitters had made commitments to peak and then lower emissions.1 Only one of the three major economies, the European Union (EU), had. For the first time many major developing nations are committed. While the most critical requirement – a reduction in global climate pollution – hasn't happened yet, the underlying commitment to find a solution has grown dramatically. The global trend-line is towards ever greater engagement and commitment. In a game-changing new alliance, Chinese President Xi Jinping and US President Barack Obama stood together last November to make a "U.S.-China Joint Announcement" on the need to act on the climate threat. Here are some of the significant climate actions by Big Three in the last few years. "No challenge poses a greater threat to future generations than climate change… The Pentagon says that climate change poses immediate risks to our national security. We should act like it," U.S. President Barack Obama said in his 2015 State of the Union9 address. The EU28 says it has already met its Kyoto promise to cut emissions by 20 per cent from 1990 levels. Since the start of 2009 their annual emissions have fallen by 355 MtCO2. Like the USA, the EU28 also recently doubled down on their climate commitment. They now promise to cut emissions by 40 per cent by 2030. That reduction rate would match the USA's newly pledged rate of reductions of 2 per cent per year. About half of the all the increases in climate pollution since 2009 have come from China. Almost all of this has come from their ever increasing amounts of coal burning. But that seems to be shifting dramatically in the last couple years. China's coal burning declined last year for the first time this century. The nation just pledged peak coal by 2020, but many analysts think it may have already peaked two years ago. Just three months ago, China became the first developing nation to unilaterally and unconditionally agree to peak emissions by a given year. They promised to peak by 2030 with "best efforts to peak early." Again, many analysts think that China is poised to peak well before 2030, which is why they made the unusual promise to try to be "early." Equally transformative are the recent decisions by several major developing economies to publicly commit to peaking and then reducing emissions. This has been a major stumbling block for decades. The shift in commitment by national governments is just one part of the story. My next article in this series will show how the post-Copenhagen 2009 surge in global climate commitment reaches far beyond national governments to include major spiritual, human-rights, military, first-nations, environmental, anti-poverty and financial groups. 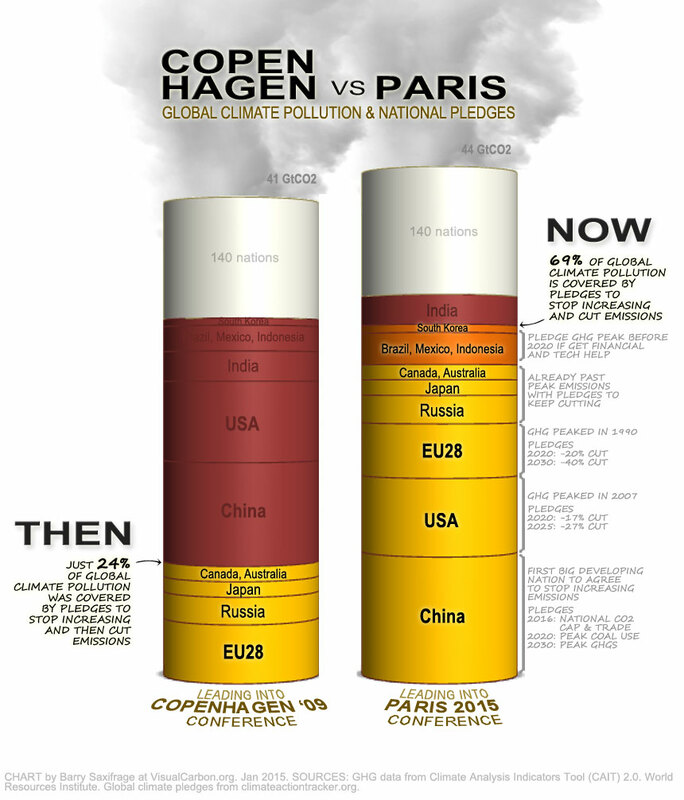 1 Country emissions data from CAIT (cait2.wri.org). THE BIG 12: Eleven major emitting nations plus the EU28 account for 74 per cent of global GHG. The remaining 26 per cent of global GHG come from the remaining 140+ nations. These BIG 12 are shown in the chart. In 2008, only the EU28, Russia, Japan, Canada and Australia had formal commitments to peak and lower emissions. These 5 produced 24 per cent of global GHG. Now in 2014, all of the BIG 12 except India have formal commitments to peak and then lower emissions. These 11 emit 69 per cent of global GHG. 2 See endnote immediately above. 3 Emissions data from CAIT. GDP data from world bank. 4 US EIA data for CO2 changes from start of 2009 to 2012, which is the latest year that data is available for. 5 First Biennial Report of the United States of America. 6 First Biennial Report of the United States of America. 7 Projected emissions through 2020 from Environment Canada's Emissions Trends 2014 report .Projected emissions from 2020-2030 from federal government's National Round Table on the Environment and the Economy report "Reality Check: The State of Climate Progress in Canada". Quote: " emissions continue to grow between 2020 and 2030 even under all existing and proposed policies"
8 "The new U.S. goal will double the pace of carbon pollution reduction from 1.2 percent per year on average during the 2005-2020 period to 2.3-2.8 percent per year on average between 2020 and 2025." 9 US President Barack Obama in 2015 State of the Union address. 10 Brazil, Mexico, Indonesia and South Korea all have pledged to peak emissions by 2020 if given financial and technical help.